Figure-Skating Film Is A Success In The U.S.
"Blades of Glory", a comedy about figure skating, was a big hit with American audiences this weekend. 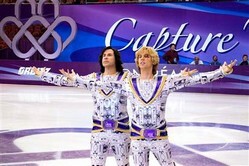 Comedians Will Ferrell and Jon Heder star as two figure-skating rivals. They get into fight when they tie for a championship. The fight causes them to be banned from the sport for life. However, they find a rule that allows them to compete together. They go on to become the sport's first men's pair. 1. American audiences didn't like "Blades of Glory" very much. 2. The two main characters fought in the movie because one won and the other lost. A. They will never be able to compete again. B. They were punished, but will be able to compete again. 4. Were the characters able to compete again after they were banned? 5. How were they able to do that? A. They broke a rule. B. They found a rule that helped them. C. Someone allowed them to compete again.